Autumn in a playful, contemporary mood. 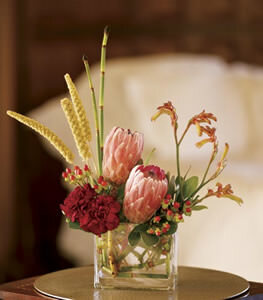 Send this imaginative floral arrangement to someone who appreciates an occasional twist. A clear rectangular vase, filled with pink mink protea, pink kangaroo paws, burgundy carnations, red hypericum, equisetum, galax leaves and green pittosporum.